June marks the start of Zambia’s prime safari season, but many lodges still offer reduced ‘shoulder season’ rates so it’s one of the best months to visit. Later in the season conditions can get very hot, but June is cool and pleasant, with daytime highs not much over 25°C and nightly lows around 10°C. Pack thick socks and a warm jacket for early morning walks and game drives. And prepare yourself for one of Zambia’s best months for a walking safari. The Luangwa Valley is Zambia’s walking safari mecca, although all the major parks offer guided walks as well. South Luangwa National Park is where it all began, however, and the region still boasts some of the most experienced walking guides in Africa. June in Zambia is cool with clear skies, and after a month or two without rain the vegetation is thinning, but not yet completely desiccated. It’s a beautiful time to walk in the parks and you’ll find a range of walking safaris available. The more adventurous can try multi-day mobile safaris where guests walk between temporary camps, through some of Zambia’s most pristine wildlife areas. North Luangwa National Park is especially wild and the few operators in its southern section are walking safari specialists. Northwest of the Luangwa Valley, the Bangweulu Wetlands are also excellent in June. Those wishing to see the strange, smirking shoebill will have better chance at the beginning of the month, before the floods recede. 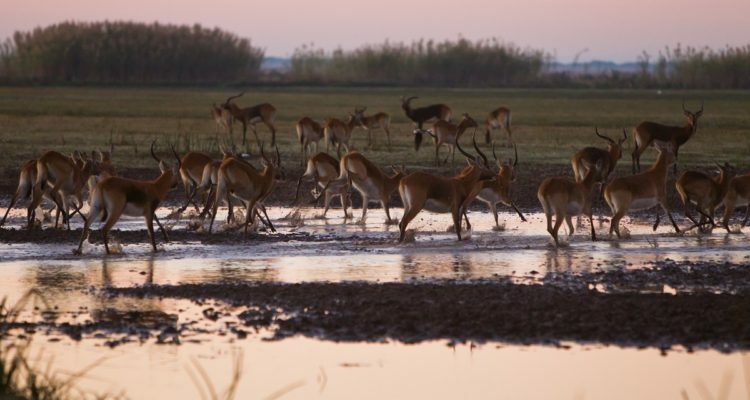 As the waters withdraw, the endemic black lechwe emerge from the surrounding woodlands, gathering in great herds on the exposed floodplain. Across in northern Kafue, the Busanga Plains also begin to dry out in June. Here you’ll find red lechwe and roan and sable antelope, as well as elephant, buffalo, lion and leopard. By late June, the dirt roads of Kafue and Liuwa Plain National Park have usually reopened to self-drivers and as the region’s rivers subside and become clearer, the fishing conditions take off. It’s a wonderful time to combine a safari and fishing holiday along the Kafue and/or Upper Zambezi rivers. Bream and tigerfish are the prized catches in the area. Although June is a great time to see Victoria Falls in high flow, the waters are usually still too high for the best white-water rafting. Half day trips starting further downstream are possible, but these skip the highest-grade rapids closer to the falls. The famous Devil’s Pool swim, above the falls, is also closed until around August, but guided walks onto Livingstone Island are normally operating by the end of the month.